1. Provide students with copies of map sheets (Figure 1) photocopied on heavy paper (card stock), each with a number of frames (F1 to F20). These frames are reconstructed maps of the landmasses that existed on Earth at a specific time. The interval between successive frames is 10 million years (mya = millions of years ago). Frame 20 depicts landmasses as they are today. The maps are a view (projection) of the entire Earth, showing the outline of the continents, onto a flat surface. 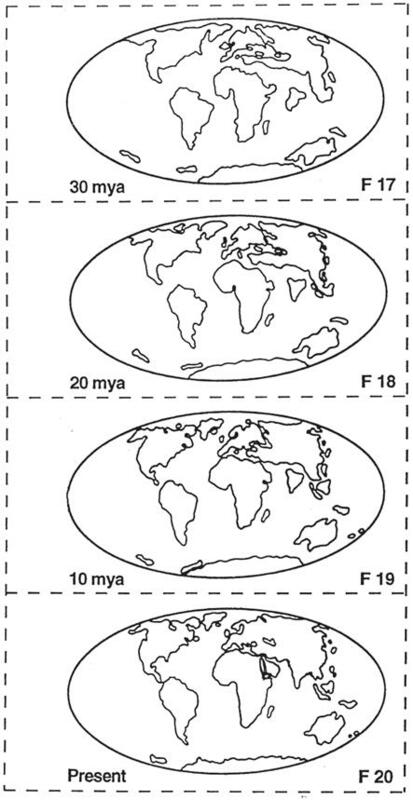 The orientation and representation of the Earth’s continental regions can be most easily visualized by looking at map F20 (present day view) in Figure 1E. On this and the other maps, the equator (zero degrees latitude) would be a horizontal line through the middle of the map area (through northern South America, central Africa and Indonesia). Similarly, the Prime Meridian (zero degrees longitude) would be a vertical line through the middle of the map area (through England, Spain and western Africa). 2. Beginning with frame 20 and working back-wards, have students identify the landmasses listed in the table below. Have student groups color these landmasses as indicated in the table, assigning a different land mass to each student group. Have students continue working backwards through the frames until they can no longer identify the individual landmasses. 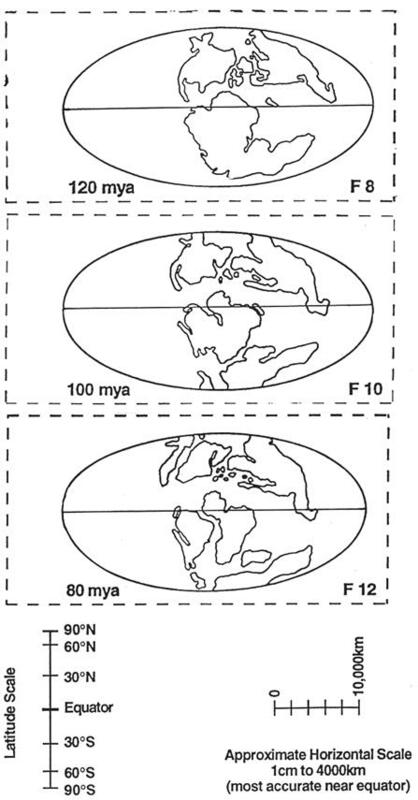 By assigning different land masses to different groups, the students will be able to share their results when the flip books are completed and several different continental movements and plate tectonic interactions will be illustrated on the different flip books. b. Working backwards through time (begin with F20), select two continents that display a particular plate tectonics interaction and color the continents on the frames back through time until the continents are together. Good examples are Africa and South America or Europe and North America that illustrate continental separation (divergent plate boundaries) and opening of the Atlantic Ocean basin through time, or India and Asia that shows a continental collision (convergent plate boundary). 4. Have students cut out each frame carefully along the outside frame lines. When all rectangles are cut out, stack them in order 1-20. Frame 1 should be on top (although the frames could also be ordered so that F20 is on the top, but it is useful to have all the flip books have the same order to minimize confusion as students share their individual flip books). Booklets should then be carefully aligned and stapled securely along the left side. A heavy-duty stapler will work best with the card stock. Alternatively, small binder clips can be used. 5. Holding the rectangles along their left side, have students flip through the frames, observing changing position of the landmasses (plate movement and continental drift). They are modeling the breakup of Pangea and the movement of landmasses over 190 million years, arriving at the configuration of our present-day continents. 6. Encourage student groups to exchange and view various flipbooks in order to make observations and inferences from the movements of the different continents. 1. What event began to occur about 190 million years ago? 3. 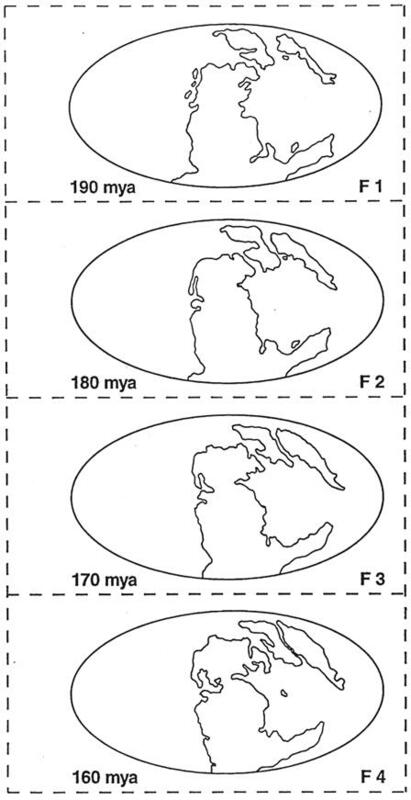 In which frame did you locate the final breakup of Pangea? Why did you choose that frame and not another? 5. If mountain ranges can form where plates are colliding, what would you hypothesize might occur where plates are separating? Apply your hypothesis to identify locations on a world map where plates might be separating (both oceanic and continental lithospheric plate divergence zones can be identified on the map and in the flip books). The flipbooks will help you identify previous plate separations. 1. Using selected frame sheets (Figure 2), have students color the land mass identified as India today on each of the frames. Have students graph the changing position of India’s landmass (distance from the equator by identifying the latitude of the approximate center of India through time; the latitude scale on Figure 2A should be used to estimate the latitude of India on each frame) over time, using the provided graph paper (Figure 3). The equator is the horizontal line on the maps in Figure 2. Note the probable effects on climate of India through the past about 100 million years (paleoclimate) as India’s position has changed. How would this climate be different then the climate in India today? Can you find any evidence (in available books or reference materials or in an Internet search) that supports the concept of a different climate for India 100 or more million years ago? Students could choose a different land mass and repeat this graphing activity to compare movement over time. 2. Repeat the previous activity having students measure and plot the opening of the Atlantic ocean through time. 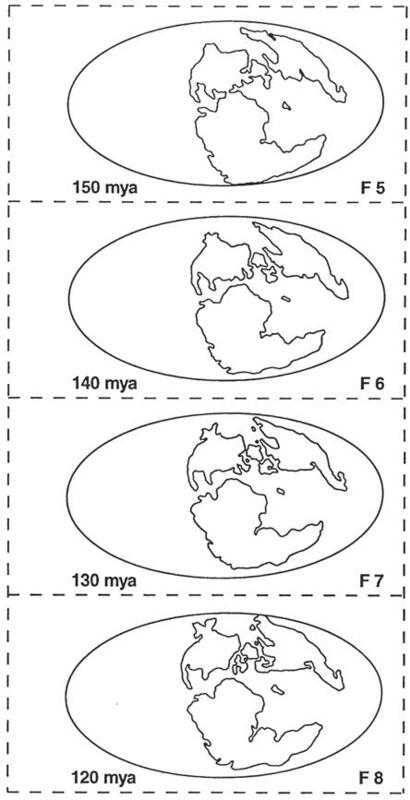 Select two locations on opposite sides of the Atlantic on Frame 20 on Figure 2B (present or 0 mya map). Suggested points in the north Atlantic are: the northeastern US on the east coast of North America and the Iberian peninsula (Spain) on the west coast of Europe. Suggested points for the south Atlantic are the easternmost point along the east coast of South America (eastern Brazil) and the prominent indentation along the west coast of Africa near Nigeria. Referring to these points on a world map or on a transparency of Figure 2B on an overhead projector may be useful. Measure the distance between these points using the kilometer scale provided on Figure 2A. Plot the distance between the two points, showing the opening of the Atlantic through time, on the graph provided in Figure 4. It will be easiest to work backwards (beginning with Frame 20) through time. You should be able to recognize a separation between your two points back to about 80 to 120 million years ago. As a challenge, calculate the approximate average speed (say in km/million years) for the opening of the Atlantic inferred from your graph. How does this speed compare with typical plate velocities (1-15 cm/yr) that are inferred for contemporary plate tectonic motions (you will need to make a conversion between km/million years and cm/yr in order to make the comparison)? Atwater, Tanya, Continental Drift and Plate Tectonics, 20 minutes videotape, 1988. Bolt, B.A., Earthquakes and Geological Discovery, W.H. Freeman, New York, 229 pp., 1993. Ernst, W.G., This Dynamic Planet, Columbia University Press, New York, 281 pp., 1990. Edition, August, 2000. (available from FEMA Publication Warehouse, 1-800-480-2520). Figure 1. 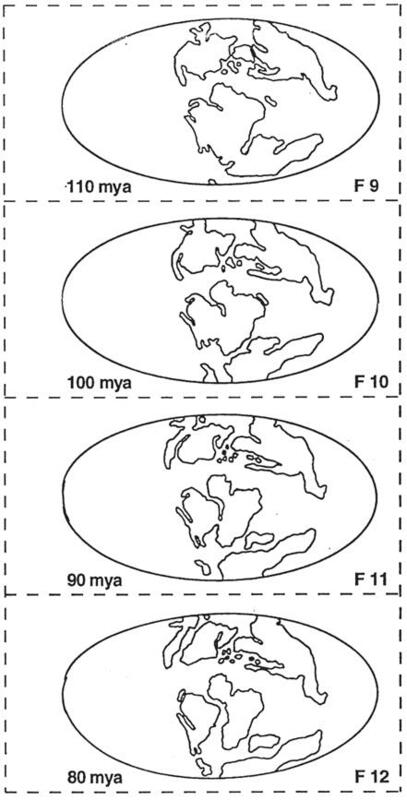 Frames F1 through F20 showing the configuration of the continents on a projection of the Earth (the equator would be a horizontal line through the middle of the map; the prime meridian would be a vertical line through the center of the map) from 190 million years ago (mya) through the present. A. Frames F1 to F4. B. Frames F5 to F8. C. Frames F9 to F12. D. Frames F13 to F16. E. Frames F17 to F20. Figure 2. 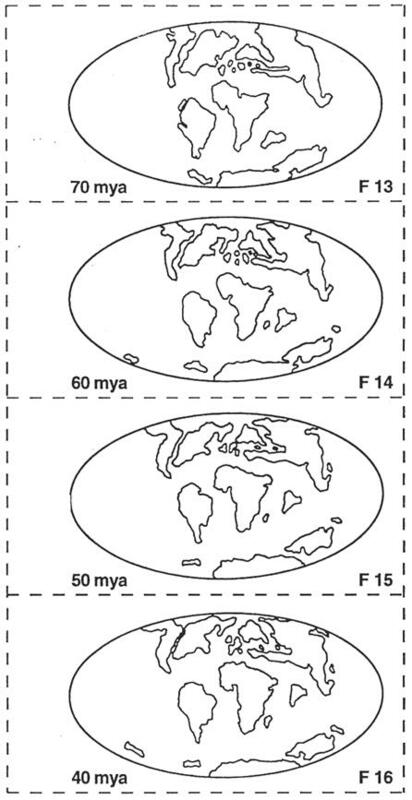 Selected maps for measuring the positions of continental regions through time. The horizontal line through the center of the map is the equator. A. Frames F8, F10 and F12. Scales at the bottom of the figure are for determining latitude and measuring distances between two landmasses. B. Frames F14, F16, F18 and F20. Figure 3. Graph for plotting position (latitude) of a continent (India, for example) through time. Figure 4. 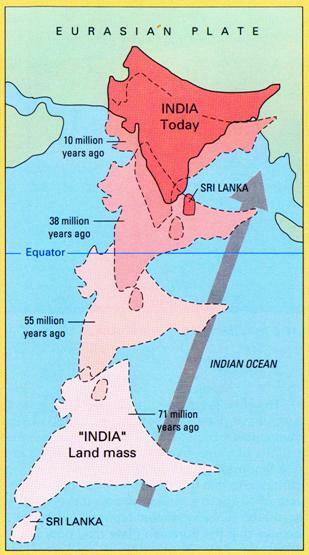 The movement of the Indian subcontinent through time by plate tectonics motions (from USGS, "This Dynamic Earth – The Story of Plate Tectonics"). Figure 5. Graph for plotting distance between two continents through time as the Atlantic Ocean basin opened. ãCopyright 2000. L. Braile and S. Braile. Permission granted for reproduction for non-commercial uses.